In an ideal potty training world, we would all go to work knowing that the potty training program we've chosen for our children is being followed to the letter in daycare as well as at home. With some good communication and team work it is perfectly possible to successfully potty train a child between the home and daycare; however, caregivers in the average facility won't be able to dedicate as much as time parents to a one-on-one potty training approach. Here are some tips on how you can communicate effectively with your daycare provider to ensure your child's success. Choosing the best method for your child is the first step on your journey. Even at this early stage, it may be a good idea to discuss toilet training with the staff at your daycare facility. They are likely to have professional experience that you may not, especially if this is your first potty training adventure. Their input will also allow you to consider a method not too different from their's, if that's what you wish to do. There's no doubt that your child will benefit from consistency between the program he or she experiences at home and what happens at daycare. 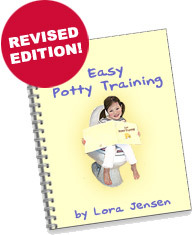 If you want to successfully kick start the potty training process at home, then the 3-day easy potty training method is a great way to begin. Over the course of a long weekend, you can begin your child's training in using the potty for number 1 and number 2, during the day and at night. This definitely gives your child an advantage the next time he or she arrives in daycare. It's important to respect your daycare staffer's professional experience while looking out for your child's best interests at the same time. Remember that the staff is probably looking after many children, each of whom has a set of concerned parents just like you. Staff simply may not be able to follow all your requirements. Therefore you should decide on the most important parts of your program and speak to your carers about them. Noting down the main elements of your plan on paper and giving it to your care providers might help them to remember. You could also make an appointment to speak to a member of staff when they really have time for you. If you have any absolute no-go areas, such as criticism or shaming of your child if he or she has an accident, make sure staff know about this. It couldn't hurt to emphasize to them the importance of praise too. Remember, all this needs to be done in an atmosphere of respect and trust. Treat your caregiver as a professional and let him or her know how grateful you are for their help in potty training your child. Some working parents worry that their children won't potty train as quickly as those with stay-at-home parents, but these fears are usually unfounded. One study in the United States found no real difference in the length of time it took daycare and home care children to train. It emphasized the need for parents to be patient and supportive and not to worry about small set backs every now and again.